EARLY BIRD registration ends March 31! Looking for positive, Christ-centered activities for your child this summer? I encourage our children to attend Connect Christian Camp. But, for the BEST REGISTRATION RATE you must register online by March 31. For our church discount code, call the church office or contact me, Mrs. Mindy. All grades are posted as grade your child will be in fall 2019. Kids Camp | June 11 | Grades K-2 | Register by March 31st for the $30 early bird price. Kids Camp allows our youngest campers to experience a taste of camp in ONE exciting day: swimming, crafts, Bible lessons and more! This year campers ages 5 years old through second grade are invited to join us on June 11th. Check in starts at 8:30 am and campers will stay busy until 4:30 pm. Ready for a longer stay at camp? Look no further! Stay in the dorms with friends, experience campfire each night and swimming every day—all while learning about God’s awesome love for you! This short session is designed for K-2nd graders to get a taste of camp. With a high adult to camper ratio this action packed camp will be the highlight of your kid’s summer. Great lessons, fun crafts, memorable games, pool time, campfire, worship, and family groups will have your camper planning for next year as soon as they leave. A camp experience as unique as your camper. These new camps are custom designed for 3rd through 12th graders so that your whole church can experience camp together. 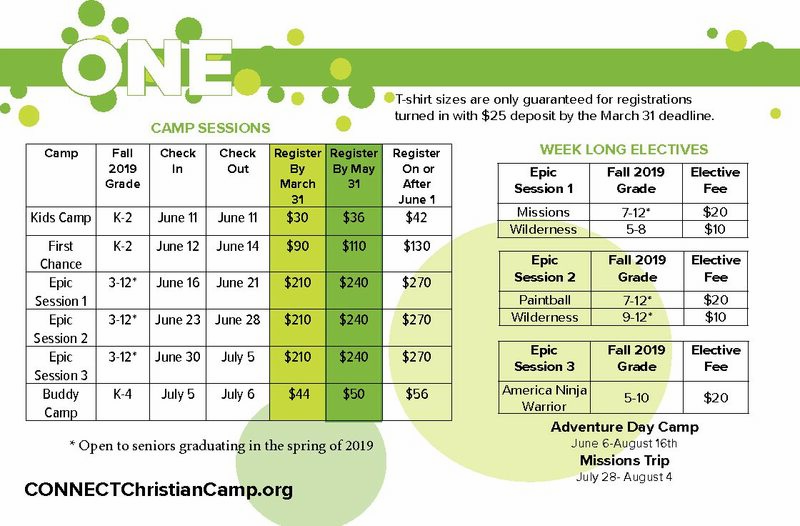 Think of it as 3 sessions of camp (EPIC Elementary, EPIC Middle School, and EPIC High School) running at the same time. Each day will be filled with electives for each age group to choose between, main sessions and Bible lessons geared towards their specific age group, games they have never played before, and all the things they love about camp: making friends, gathering around a campfire, swimming in the pool, and creating life-long memories. *All EPIC sessions have separate programming and housing for 3rd-5th, 6th-8th, and 9th-12th.